Mafi possesses a rare gift when it comes to manipulating language. Her words flow off the pages effortlessly. I was immersed in Juliette's thoughts, surrounded by the danger and chaos that is her world. The prose is breath-taking and completely addictive. I couldn't stop turning pages. 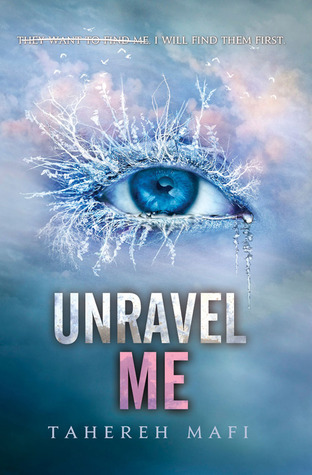 I adored Shatter Me, and I knew from page one of Unravel Me that the sequel wouldn't disappoint. Almost everything is kicked up a notch in this second book. From the heart-breaking romance to the fast-paced action scenes, everything is more intense. The plots occurs on a broader scale. Instead of revolving solely around Juliette and Adam's escape, Unravel Me follows the revolutionary movement occurring underground. Omega Point reminds me strongly of the X-Men movies; individuals with abilities seek shelter with the movement and train to harness their powers in order to use them as weapons in the upcoming war. Other characters like the hilarious Kenji get more stage time, which I was ecstatic about. When I pick a "team" in an love triangle, I usually refuse to budge from my position. I choose a boy and stick with him until the end. However, things were different with Unravel Me. My heart was constantly being pulled in two directions. Adam is her first love, the boy who taught Juliette that she could be different, that she isn't a monster. Warner, however, is such a deep and complicated character. Mafi elaborates on his character so much more in this second book, and I couldn't help but develop feelings for his character as well. In fact... I might.... I might even be on Team Warner now. DID I JUST SAY THAT? The only reason I didn't award this book with five stars was Juliette. When I read Shatter Me, I admired her character so much. She seemed so strong, even in the face of death and isolation. Unfortunately, I didn't feel the same way about her in the sequel. Juliette spends a large portion of the story moping about, crying because she feels like a freak and unsure of her own abilities. I grew impatient with her weakness. Thankfully, the end of the story seemed to banish some of her insecurities. I have extremely high hopes for her character development in the next book. Overall, I can say Unravel Me met my expectations, even if it didn't surpass them. I cannot help but enjoy Mafi's writing. It's unlike anything else I've read. And after that crazy ending scene, I am desperate for a sequel. *Goes to goodreads to find out release date* FEBRUARY 2014?!?! ARE YOU TRYING TO KILL ME MAFI? Good grief. Anyway, if you haven't started this series or read this second book, do it. Now.